Tuesday March 14th was a snow day again. After a mild winter, March is showing its might. The Bard did say " Beware the ides of March" with his infinite wisdom, of course. So, the Village Board meeting as well as Budget discussions were moved to Wednesday night, plus the regular VB meeting and then the VCP ( Voters' Choice Party ) Town Hall meeting at Heathcote Church made for a busy night. 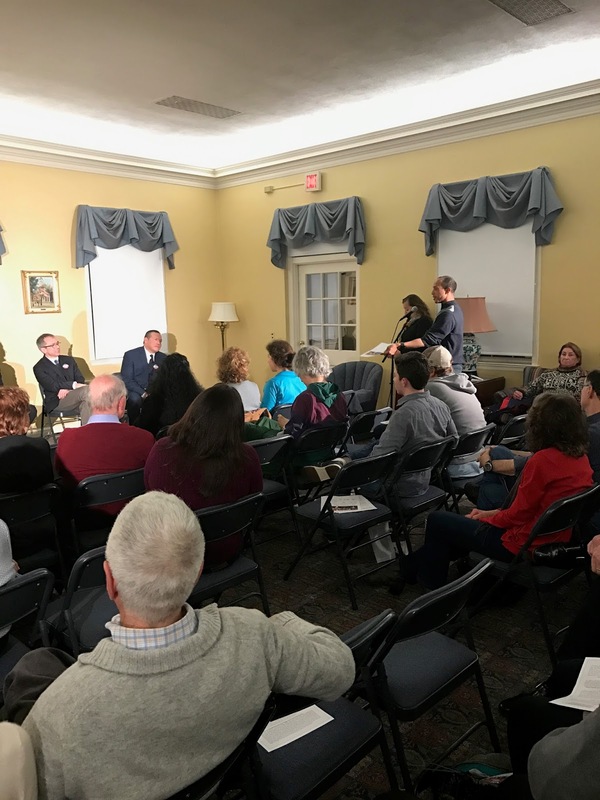 I attended the Budget discussions, then part of the VB meeting and finally at about 9:15 p.m. when Bob Harrison started to talk, I made my way over to Heathcote Church for the Voters' Party meeting. Back from the VCP meeting I watched the VB meeting on line until it ended at about 10:15 p.m.
As you can see below, the agenda was put up on the screen. Discussions was item number 4. 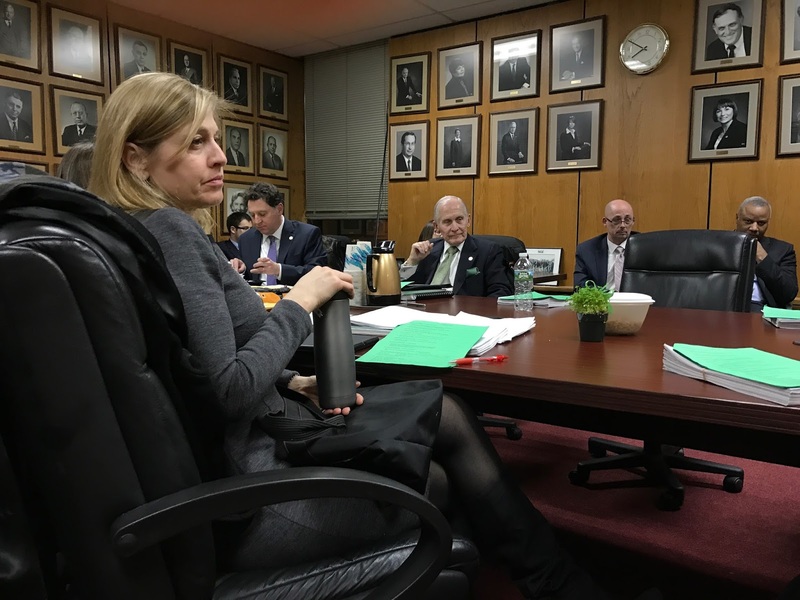 The Board started discussions at about 7:40 p.m. during what was going to be Agenda discussions. It was all hurried, as usual. 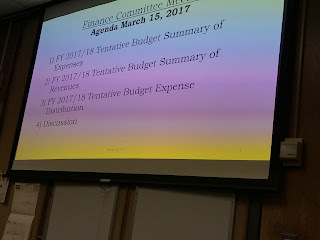 Budget discussions have been going on since the Fall, so if you did not attend all those meetings they have little patience for your comments or questions... Who can attend all these meetings ? If you did not they do not let you talk. At the end of their day, having attended all those meetings, they do not have much patience left. I do not blame them, they are tired. But then again residents like myself need explanations. Go figure. I learned the VB did not hire the consultants that presented a while ago, for the Assessor's office. On the consultant note, I was happy to hear Mary Lou and Rob Cole took on the job of finding auditors for our Village. An RFP ( request for Proposals ) went out and of the firms that responded they decided to concentrate on two. More on this later as I get more information. 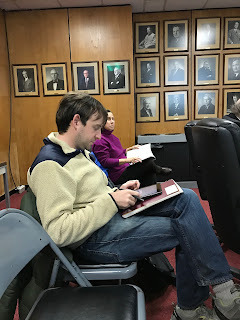 The Mayor recused himself from the Teen Center discussions as well as the vote, because somebody e-mailed ( I thought ) and thought he should...His wife BK chairs the Adult Board of the Teen Center. Picture below of residents in attendance. That is Ron Schulhof and Lena Crandall. A little later Janet Starr of the LWVS and Bob Harrison came in. 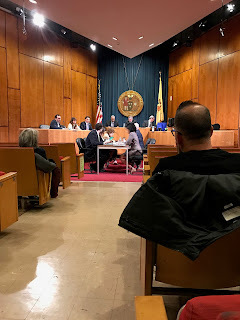 This is a picture of some of the Trustees around the table and Rob Cole and Village Attorney Esannason at the periphery of the room. Here below is the VB meeting at Rutherford hall. The usual number of residents in attendance. Not many. Less than 10. I thought. After the usual Mayor's and Manager's comments about storm event we had, it was time for residents' comments. Mr. Amidor, the contractor and resident objected to the fee he was going to get charged at 19 Griffen. 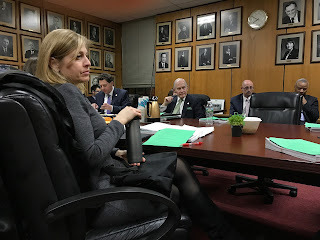 Trustee Stern commented on the loss of green space. Finally !!! The Mayor decided to table this and said they would need to talk about this. At least, that is what I could catch. I cannot view the VB meeting on Cable yet. On the other hand I do want to get at least a preliminary report out, and then revise it as necessary. Josh Frankel talked about the recent posts on the Scarsdale10583.com about the Ryan reval. He objected to them because the author is a member of the CNC and Josh took this as an attack on the VCP....or some such thing like this. I have objections about the report since it picked and chose data claiming some were "arms' length" transactions' etc. Either name each data and explain the exclusion or else interpret data with them included. In any statistical data there is bound to be some not fitting the curve... that is by definition statistics. Myra Saul of Lincoln Road wanted to talk about immigration. People are emotional about this, like their grand-mother is coming through Ellis Island. I am an immigrant myself. I can tell you the story is not like it was in 1916 or 1816... Now there are many opportunities for you to come in legally, even in the late '70's. In Turkey there is even a lottery you can apply to, to come to the States. So, there is no reason for anyone to be here illegally, other than the ones who should not be here. That is the ones who like to fly planes to our Towers. By all means the Police should ask the immigration status of aliens they encounter and if illegally here, they have no business being here and should deported ASAP. It is not 1916 any more. No excuses. We are a nation of immigrants with good intentions, not destructive ones. The ones with good intentions are welcome here as they have been always. Finally here above is the Town Hall meeting of the VCP. When I pulled in the parking lot of the Church at about 9:20 p.m. there was hardly any room to park. 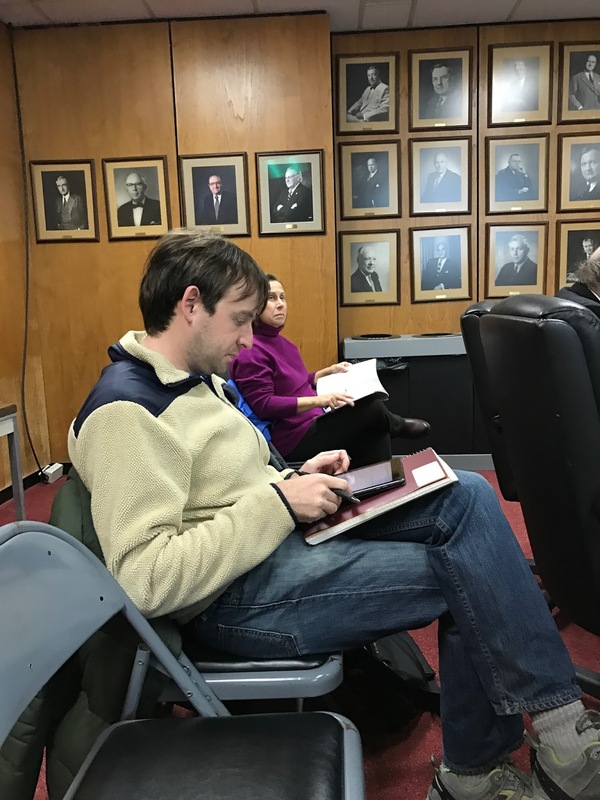 The meeting was scheduled to last till 9:15 p.m. and went on well past that. We all helped clean the room, tidy up the chairs at about 9:45 p.m. Mayra Kirkendall-Rodriguez let me ask the last question. Thank you Mayra ! When I came in this gentleman was asking a question as pictured above. He thought rightly so, with all these new houses going up, we should have a surplus of tax revenue... And yet, our Finance Committee's diligent efforts result in tax hikes year after year. What about a decrease in the Budget ? Of course, volunteers' time spent on top of all this, that should further decrease the tax burden...But no. Jane Curley was the next one to ask a question/ comment about her experience renovating her house. She found the process complicated and convoluted. She reasoned since her efforts would increase tax revenue, Village Hall had to be a little more accommodating. Then I got up and talked about my desire to preserve this beautiful Village. OK, I will let go of the not so becoming ranches, but the lovely stone and wood houses should stay. Styrofoam stucco and synthetic slate should be banned by the BAR. We agreed on the Big House problem with Mayor hopeful Bob Berg. I reminded all to enter my " Cute House " contest. There was a gentleman who loves a house on Drake Road, with the towers, etc. I encouraged him to take a picture and enter the contest. Here is the link: Click here, please. The deadline has been extended in view of Tuesdays' storm. There will be a "Get out the Vote Rally" on Saturday March 18th, 7:00-9:00 p.m. of the VCP. Details posted as they become available. For more information, please go to the VCP website:Click here, please. Good luck VCP ! We need new blood and a jolt to reality and modern times of the NP ! Last revised at 9:58 a.m. EDT Thursday March 16, 2017.